Say good-bye to thimble, boot and wheelbarrow. The thimble, boot and wheelbarrow will be replaced by T-Rex, rubber ducky and penguin tokens this fall. 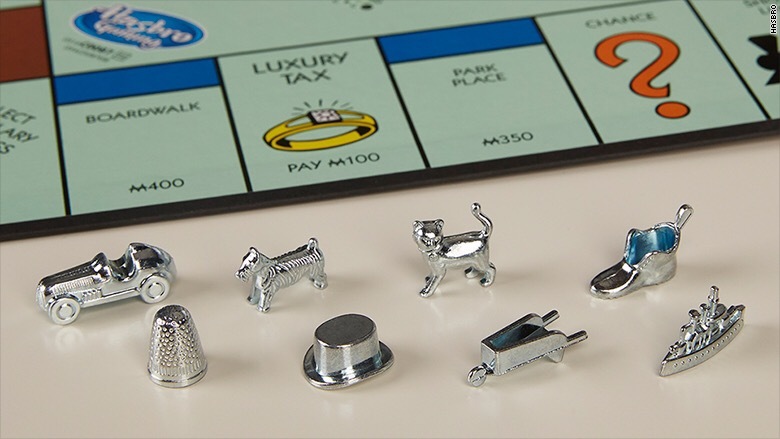 The iconic game pieces met their fate after millions of fans voted on which eight tokens they’d like to see in the next version of the game during Monopoly Token Madness Vote in January, Hasbro said in a statement. So, who made the cut? The Scottie dog, top hat, car, battleship, cat, T-Rex, rubber ducky, and penguin tokens, are the eight game pieces that will be featured in the next generation of the game. In mid-February, fans learned the thimble’s days were numbered, but the game maker waited until two days before Sunday’s World Monopoly Day to reveal that two other iconic pieces were also getting the axe.